RRB Guwahati Group D Recruitment 2018-2019 Notification is out and grabbing the attention of the people who are searching for the Railway Jobs. Here in this post, we are going to write down each and every detail that is mentioned in the advertisement. So, all the people who are willing to utilize this good opportunity should check this post to get the information. As per the information that is given in the RRB Guwahati Group D Recruitment 2018-2019 Notification there are total 2577 Track Maintainer Grade IV (Trackman), Gateman, Pointsman, Helpers in Electrical/ Engineering/ Mechanical/ Signal & Telecommunication departments, Porter & Other Vacancies. And all of these will come under the Group D. Therefore, those people who are interested can go forward and find out more other details that are mandatory to submit the filled application form. Check this post further for more information. So, as soon as the RRB Guwahati Group D Recruitment 2018-2019 Notification is out many contenders started their search to get the details. Therefore, to help all such people, here we are providing this article. According to the data that is given in the official RRB Guwahati Group D Recruitment 2018-2019 Notification, all the people should submit their filled application form before the closing date. And the Final date is 31st March 2018. Contenders should notice that the Officials of the Railway Recruitment Board Guwahati are accepting the applications from 10th February 2018 itself. Therefore, keep this in mind and proceed forward. Remember that your application is invalid if you are submitting it after the closing date. More other details that are important at the time of submitting the Application Form are available in the next sections of this post. Check them all. So, as the RRB Guwahati Group D Recruitment 2018-2019 Notification is out, many of the people are checking for the single source to get the complete details. Now, here we are making this article, that contains all the information. So, here we are giving a table. And it contains all the details. Check them. You will have an idea. Now, coming to the part of the educational qualification. All the applicants should have finished their 10th class or ITI or its equivalent from NCVT or SCVT in India as the educational Qualification. Remember that at the time of applying, you all need to have had it compulsorily. Only if you have the educational qualification, then proceed to check the remaining details. If not check another recruitment. Now, after the educational qualification, next importance is for the age limit. 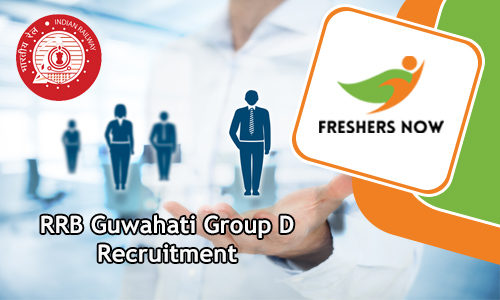 Having the correct age is pretty important to consider your application for the RRB Guwahati Group D Recruitment 2018-2019. As per the information in the RRB Guwahati Group D Recruitment 2018-2019 Notification, those people who are applying for the 2577 Group D Vacancies, should have the minimum age of 18 years. And the maximum age should be 31 years are the eligible for Railway Guwahati Group D Job Openings 2018. Also, for age relaxation, you should refer the advertisement. And for the sake of the people, here at the end of this post, we are giving the link of the notification. Now, another important requirement you all should aware is an application fee. In the notification, the officials asked the contenders to pay Rs.500 as the application fee. And the SC/ST/Ex-serviceman / Women should pay Rs.250 as the Application Fee. Remember to check the RRB Guwahati Group D Recruitment 2018-2019 Notification twice before making the payment. So, you should pay the application fee before the final date. Along with the submission of the application form. Remember that your application is not valid for the RRB Guwahati Group D Recruitment 2018-2019 if you are not having all of these requirements correctly. And now coming to another important part of the RRB Guwahati Group D Recruitment 2018-2019 Process is Selection Rounds. All the applicants who are eligible and apply before the final date have to clear them if they want to get the job in the RRB Guwahati. The officials are very particular in choosing the best people for the available positions. And also there is so much competition. Prepare well. Check the next sections for more. so, the applicants have to clear the Written Test (Computer Based Test), Physical Efficiency Test (PET), Document Verification, Personal interview rounds. Freshersnow.comAnd remember that you will go to one round only if you clear the above round. Remember that only the performance is considered for the final selection. Therefore, try to gather the materials and start your preparation as soon as applying. And here on our site you will the Preparation materials, that will help you to crack the exam. Now, soon after clearing the recruitment rounds and getting placed, officials are going to pay the salary of the applicants every month. As per the information in the RRB Guwahati Group D Recruitment 2018-2019 Notification, people will get Rs.18,000/- per month as the salary. Now, in the next sections of this post, all the people will find the details. And these will give you outline. Check them all. Remember this is a good chance. Therefore utilize it. we are even attaching the official RRB Guwahati Group D Recruitment 2018-2019 Notification. All the contenders can find the link to download the advertisement at the end. Simply by clicking on the link, you can download the notification. And check for the RRB Guwahati Group D Recruitment 2018-2019 Notification.